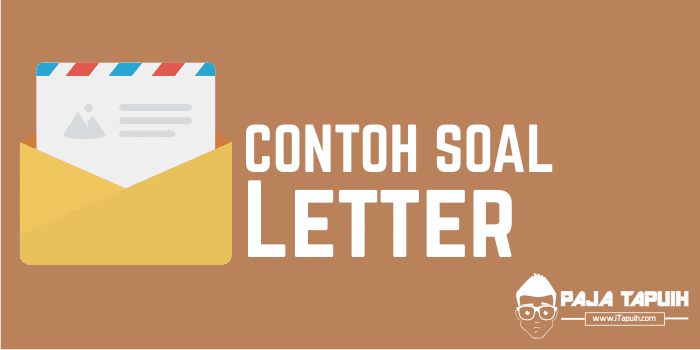 iTapuih.com - 10 Contoh Soal Letter Text dan Kunci Jawaban Terbaru. Letter text adalah salah satu jenis text yang bertujuan menyampaikan pesan tertulis dari satu pihak ke pihak lain yang berisi informasi. Secara sederhana text ini lebih menonjol kepada komunikasi tertulis atau cetak yang ditujukan kepada seseorang atau organisasi dan biasanya dikirimkan melalui pos. Dalam artikel ini saya akan membagikan 10 Contoh Soal Letter Text dan Kunci Jawaban Terbaru untuk pelajar Sekolah Menengah Pertama kelas 7, 8 atau 9 SMP/MTs. Soal-soal dibawah ini bisa Anda download pada link bagian paling bawah postingan. Aunty, I have some good news for you. Last month I passed my final examination. A week ago I succeeded to join in a senior high school English competition. Last night my parents promised to send me to a famous English course in my town. They also promised me if my scores in English are good, they'll send me to a foreign university. Great, isn't it? I'll work hard. I want to be a great pediatrician like you, Aunty. Well, that's all for now. Looking forward to having your news. 2. What did Debby's parents promise her? 3. How does Debby feel? I'm writing to you concerning of my last day in Jogja. I just got back from Borobudur, the wonderful temple I've ever seen. The weather is fine. We are now staying in a hotel. It's not far from Malioboro. We are treated will here. It has many excellent staff who serve the customers. We plan to go around Malioboro after the children take a short nap. We want to enjoy having "lesehan" there. It is a kind of a restaurant but we sit on the ground. Many kinds of local handicraft are sold along Malioboro street. Both domestic and foreign tourists are interested in them. I want to buy some as souvenirs. Don't worry, I'll also buy you the most interesting one. 4. How do the staff serve the customers of the hotel? 6. Who is the letter from? Hi there. How are things with you? It's good to know that you are doing fine in business. Have you received my postcard? I am now sitting in my hotel room writing a letter to you about my wonderful holiday. I think this is the most wonderful holiday have I ever had. There are a lot of interesting tourist objects to visit, beautiful local art and craft, tasty traditional food, and much more. It's Thursday today. I can't believe this my last day. I wish I could spend more time here. I am certain I will stay longer on my next visit. I'll be home about 3 p.m. tomorrow if the flight is on time. On Monday I must go back to work. I can't wait to show my video to my class. Okay, that's all for now. Send my love to your children. 8. On what day Vivian going to arrive home? Selamat belajar, semoga postingan tentang 10 Contoh Soal Letter Text dan Kunci Jawaban Terbaru bisa bermanfaat dan jangan lupa share ya.